The first month of 2013 brings with it even more hi-res deciduous trees. 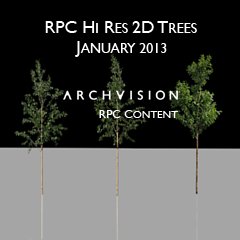 ArchVision announces the addition of (3) ready-to-use poplar trees. Check out the January hi-res trees additions including poplar, poplar  and poplar  just added to the content exchange. Poplar trees can be found all over the Northern Hemisphere. These fascinating trees have been used in so many applications throughout history. Fun fact: the Mona Lisa was even painted on poplar. Now you can add these RPCs to your masterpiece.